The party that changed the tide of the 2010 congressional races is reportedly on its last legs, according to the Daily Beast. 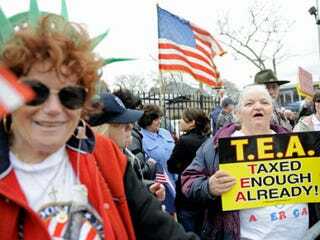 Many expected the Tea Party to have a major role in the 2012 Republican presidential primaries. But surprisingly, the movement has played a minimal part in affecting the direction of these primaries, and Tea Party leader Chris Littleton believes the movement may have been taken off the respirator in the past few months. "The Tea Party movement is dead. It's gone," says Littleton, co-founder of the Ohio Liberty Council, a statewide coalition of Tea Party groups in Ohio. "I think largely the Tea Party is irrelevant in the primaries. They aren't passionate about any of the candidates, and if they are passionate, they're for Ron Paul." In a race that is turning out to be Mitt Romney's to lose, the Tea Party seems to hold little sway, unable to rally around one candidate and with no central leadership figure. Affecting congressional races is one thing; affecting a presidential race is another matter altogether.